C869 Port Authority® – Pro Camouflage Series Cap with Mesh Back. C871 Port Authority® – Pro Camouflage Camo Series Garment-Washed Cap. Popular print and style preferred by outdoor enthusiasts everywhere. Mesh back for breathability. Garment washed for softness this cap is available in three popular outdoor prints. C877 Port Authority® – Pro Camouflage Series Cotton Waxed Cap with Camouflage Brim. C851 Port Authority® – Camouflage Caps. A light wax coating hats seals out the elements—keeping your head dry and warm. The camo brim adds interesting contrast. Fun, fashionable camouflage prints with twill sweatbands to suit all uses.Great Camouflage Colors. Our Number One Seller Is Arizona Desert Camo, Perfect For Phoenix, Arizona. 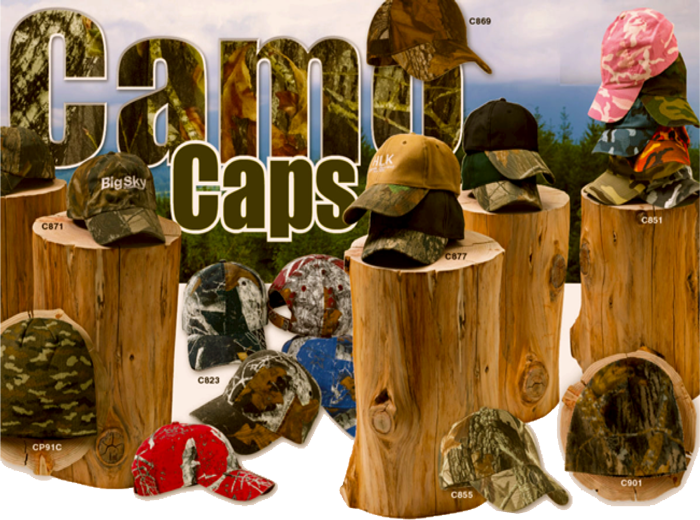 This cap features the top brands preferred by outdoor enthusiasts everywhere. A contrast front panel complements your logo on this soft washed cap. Minor distressing adds lived-in character. CP91C Port & Company® – Camo Beanie Cap. C901 Port Authority® – Mossy Oak® Fleece Beanie. A warm must-have accessory in a fun camo print. This beanie has an anti-pill finish for lasting wear and it’s perfect for times you want warmth without bulk or weight. Great for early morning outings or layered under a helmet or hat. C814 Port Authority® – Game Day Camouflage Cap. C804 Port Authority® – Safety Cap with Camo Brim. Root for your favorite team in this sweat-wicking cap that sports a broken-in camo pattern and thick stitching. Add safety to the hunt with this cap that features the popular Mossy Oak® print on the brim and closure.